While America was founded on many principles and beliefs; exceptionalism (e.g. the space program), entrepreneurship (e.g. Apple & Facebook) to name a couple, its history has also been forged by war and exploitation. And although many of its citizens consider the US to be, in the words of the 40th president, Ronald Reagan, “That shining city on the hill” (paraphrased from the Gospel according to Matthew), consider the combination of the country’s most undeniable historic elements; war, exploitation and entrepreneurship. It is the culmination of the aforementioned elements that are represented in the true life drama War Dogs. This latest offering featuring Miles Teller (David Packouz) and Jonah Hill (Efraim Diveroli) based on Guy Lawson’s book “Arms and the Dudes” resoundingly trumpets the truth so simplistically stated by the American rock band, Grand Funk Railroad, “…there’s money in them war machines….” If you doubt that truth, consider the profit margins of companies like Bechtel, Boeing, Northman Grumman and Halliburton (to name but a few) when America is engaged in global conflicts. Set in Miami (circa 1977) these two “stoners” eventually negotiate a $300 million dollar government arms deal. It was the previous lack of oversight regarding the bidding process that allowed for would-be contractors angling for position with the Pentagon (aka The United States Department of War) that made this unlikely process possible. The film is not preachy but rather an introductory and graduate course regarding how easy it was to make a fortune selling the main components of war, weapons, for those with the chutzpah to do so. While noticeably heavier in this film, than previous ones, literally and figuratively, Jonah Hill portrays the consummate psychopath. He is willing to do anything, say anything and become anybody to ensure that his own agenda is met. Miles Teller is once again cast as the wholesome, likeable yet somewhat naive “everyman,” with a pregnant wife, played by Ana de Armas and desperate for funds. The Cuban-born actress also appears in this year’s biopic Hands of Stone. Teller as Packouz is an honest kid who can’t seem to catch a break. Enter Hill as Diveroli, whose analysis of his high school friend Packouz’s massaging of high priced, mostly male clients, makes him easy grist for the mill of ridicule by his childhood friend, as well as within his own mind. Bradley Cooper (co-producer) appears mid-way through the movie as the infamous, elusive, ruthless, but in the end fair, Henry Girard. It is interesting to note that the real David Packouz has a cameo appearance in the film, suggesting his valuable input towards this movie’s credibility. Watch for the guitar player in the retirement home scene. Kevin Pollak is the almost comedic, owner of a dry cleaning chain, Ralph Slutzsky who plays the investor and then mediator when things go south between the two main characters. There are few young actors who are more enjoyable to watch on the big screen. This almost hard to believe story is an enjoyable and historically informative film, there is action, danger, close calls and betrayal. It should further be said that both of these young actors are creating an impressive body of work, Miles Teller amazing performance in Whiplash and the poignant lesser known critically acclaimed 2010 release Rabbit Hole. 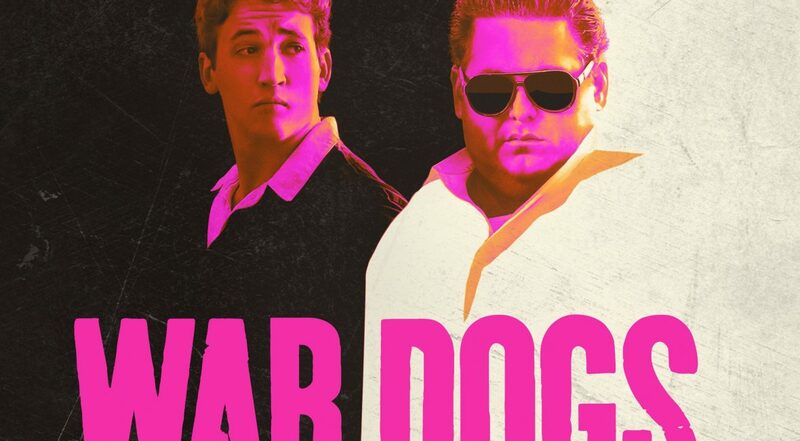 With Money ball, The Wolf of Wall Street and True Story as part of his portfolio, War Dogs proves Jonah Hill to be a multi-faceted actor. Not bad for a guy whose nascent beginnings as schoolmates with Dustin Hoffman’s children led that accomplished actor to encouraged Hill to take the plunge.